I will be watching all 10 nominees from 1937 before I move on to the next year. The goal here is to watch them and have an internal discussion among them to try to piece together a “history” of the year. Let’s get to it. We mythologize utopia as some lost dream from past society or some future to work toward. We can be certain that no such society exists where moderation is maxim and utility is perfectly cached: the desires of men are too disparate. And yet some faction of Utopian flag bearers, somewhere, still pushes the cause for a form of direct democracy where every member of a perfect society lives in harmony, balancing free will and freedom with equality and efficiency. This equilibrium, if ever achieved, is bound to be ephemeral if the conditions upon which it is tenuously based change in any way. In a society of more than one actor (by definition), these conditions can be near infinite. Yet we yearn for perfection, for redistribution, at the expense of neoliberalism, upon which our real, capitalist society is based. Why? Lost Horizon is a shallow dive into this question. In this (the first, and most successful, of many), legendary director Frank Capra supposedly shot over one million feet of film to capture the balance between the visual and the aural cues behind societal and physical perfection of mind and place. Often what makes for good tonal and internal conflict within a two-hour film is severe realism versus capricious mysticism. Searching for voice, a director will sometimes (perhaps more often than not) film with hopes of reflecting points onto which an audience can latch. This is why we often see a story through the point-of-view of a protagonist instead of an antagonist, in the grand hope that Good can overcome Evil, or that the down-on-his-luck insurance salesman can push through adversity to escape into someone – or something – else. The trick with Lost Horizon is that neither option – Utopia nor status quo – is particularly good or evil. Whose voice we follow, Robert Conway, canonizes the mood of Perfection; of non-linear, human life and desire. Conversely, Conway’s brother, George, idealizes the need to break out from what seems a trap; the linear, skeptical, human life and desire. With whom are we supposed to identify? Is it fair to assume Robert just because Capra decides as such? Why is George, a “realist,” derided? We are scared of the unknown and unknowable and fear is a powerful motivator. Through societal observation and individual experience, humans understand the meaning of conflict and have assimilated it and disseminated it through a series of value streams and norms through which to assess conflict. A society without conflict? There has never been, nor will there ever be, one as long as humans have free will. But the search for perfect is an ideal that humans understand; to strive for perfect is a recognizable and honorable goal. So we address fear through understanding and learning. In Lost Horizon, the education is twofold: a) what a utopian society is and how it might operate on a day-to-day and on a longer-term basis and b) why it will not ever work in the history of human existence. We answer why with because and leave the discussion for purists. Lost Horizon is also an exposé of sorts on fear through government. The film had such a profound message about collectivism that propagandists asked Capra to cut a speech about peace to keep young soldiers focused on War. Those afraid communism would overtake democracy sought to censor this film and later would accuse those involved in this film of undermining an American way of life. In political theory, communism is a form of government that sacrifices personal freedom for collective good: regardless of one’s own skill set, jobs were assigned that would put two hands to work in order to benefit the “greater good.” Maligned and twisted, this system can lead to political elitism and conscious hypocrisy when some members of the State are more valuable than others. This fear eventually snowballed into conflict with Korea and Vietnam in the later part of the 20th Century, but in the 1930s, those who would seek refuge in the dream of a better and more prosperous life hung onto every word of media that pushed for equality and just resource distribution. Lost Horizon takes direct aim at capitalism (personal liberalism over collective good) through George Conway; Americans understood George and thus could identify with him. Robert, an unwilling agent for capital agendas, fights back. 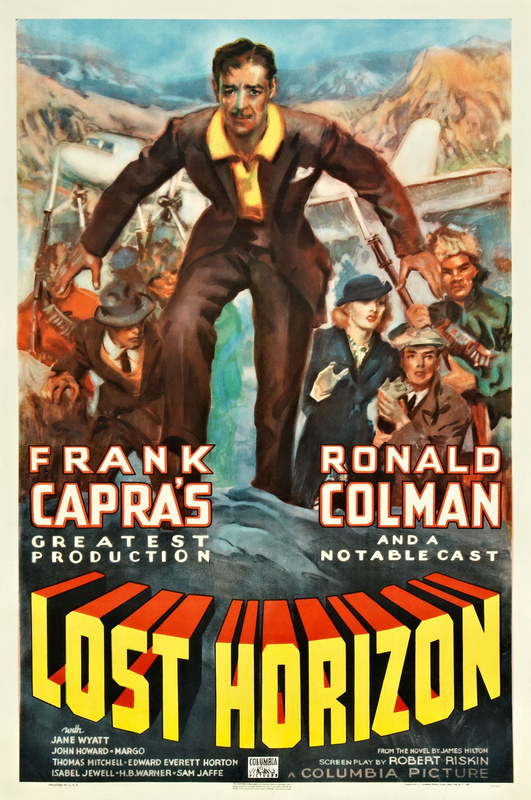 Lost Horizon makes a baffling attempt to reconcile the two. And that middle ground is where this movie thrives and has survived a horrible (musical) remake, modernization and even disintegrating negatives to remain a fan favorite nearly 80 years later. We can take comfort to know that the dream survives even though utopia continues to die an eternally slow death. I would argue that if Lost Horizon had won Best Picture in 1937, The Life of Emile Zola could have given it a shot for the title. Ronald Colman’s vivacious acting, Capra’s Utopian-style direction and the birth of Shangri-La into modern pop culture gave Lost Horizon the push to film victorious, if not for the relative immediacy of Emile Zola.